For solar thermal panels, see solar thermal energy. Photovoltaic solar panels absorb sunlight as a source of energy to generate electricity. A photovoltaic (PV) module is a packaged, connected assembly of typically 6x10 photovoltaic solar cells. Photovoltaic modules constitute the photovoltaic array of a photovoltaic system that generates and supplies solar electricity in commercial and residential applications. The most common application of solar energy collection outside agriculture is solar water heating systems. Photovoltaic modules use light energy (photons) from the Sun to generate electricity through the photovoltaic effect. The majority of modules use wafer-based crystalline silicon cells or thin-film cells. The structural (load carrying) member of a module can either be the top layer or the back layer. Cells must also be protected from mechanical damage and moisture. Most modules are rigid, but semi-flexible ones based on thin-film cells are also available. The cells must be connected electrically in series, one to another. A PV junction box is attached to the back of the solar panel and it is its output interface.Externally, most of photovoltaic modules use MC4 connectors type to facilitate easy weatherproof connections to the rest of the system. Also, USB power interface can be used. Module electrical connections are made in series to achieve a desired output voltage or in parallel to provide a desired current capability (amperes). The conducting wires that take the current off the modules may contain silver, copper or other non-magnetic conductive transition metals. Bypass diodes may be incorporated or used externally, in case of partial module shading, to maximize the output of module sections still illuminated. Solar panels also use metal frames consisting of racking components, brackets, reflector shapes, and troughs to better support the panel structure. In 1839, the ability of some materials to create an electrical charge from light exposure was first observed by Alexandre-Edmond Becquerel. Though the premiere solar panels were too inefficient for even simple electric devices they were used as an instrument to measure light. The observation by Becquerel was not replicated again until 1873, when Willoughby Smith discovered that the charge could be caused by light hitting selenium. After this discovery, William Grylls Adams and Richard Evans Day published "The action of light on selenium" in 1876, describing the experiment they used to replicate Smith's results. In 1881, Charles Fritts created the first commercial solar panel, which was reported by Fritts as "continuous, constant and of considerable force not only by exposure to sunlight but also to dim, diffused daylight." However, these solar panels were very inefficient, especially compared to coal-fired power plants. In 1939, Russell Ohl created the solar cell design that is used in many modern solar panels. He patented his design in 1941. In 1954, this design was first used by Bell Labs to create the first commercially viable silicon solar cell. Depending on construction, photovoltaic modules can produce electricity from a range of frequencies of light, but usually cannot cover the entire solar range (specifically, ultraviolet, infrared and low or diffused light). Hence, much of the incident sunlight energy is wasted by solar modules, and they can give far higher efficiencies if illuminated with monochromatic light. Therefore, another design concept is to split the light into six to eight different wavelength ranges that will produce a different color of light, and direct the beams onto different cells tuned to those ranges. This has been projected to be capable of raising efficiency by 50%. A single solar module can produce only a limited amount of power; most installations contain multiple modules. 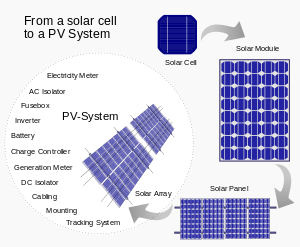 A photovoltaic system typically includes an array of photovoltaic modules, an inverter, a battery pack for storage, interconnection wiring, and optionally a solar tracking mechanism. Scientists from Spectrolab, a subsidiary of Boeing, have reported development of multi-junction solar cells with an efficiency of more than 40%, a new world record for solar photovoltaic cells. The Spectrolab scientists also predict that concentrator solar cells could achieve efficiencies of more than 45% or even 50% in the future, with theoretical efficiencies being about 58% in cells with more than three junctions. Currently, the best achieved sunlight conversion rate (solar module efficiency) is around 21.5% in new commercial products typically lower than the efficiencies of their cells in isolation. The most efficient mass-produced solar modules[disputed – discuss] have power density values of up to 175 W/m2 (16.22 W/ft2). Research by Imperial College, London has shown that the efficiency of a solar panel can be improved by studding the light-receiving semiconductor surface with aluminum nanocylinders similar to the ridges on Lego blocks. The scattered light then travels along a longer path in the semiconductor which means that more photons can be absorbed and converted into current. Although these nanocylinders have been used previously (aluminum was preceded by gold and silver), the light scattering occurred in the near infrared region and visible light was absorbed strongly. Aluminum was found to have absorbed the ultraviolet part of the spectrum, while the visible and near infrared parts of the spectrum were found to be scattered by the aluminum surface. This, the research argued, could bring down the cost significantly and improve the efficiency as aluminum is more abundant and less costly than gold and silver. The research also noted that the increase in current makes thinner film solar panels technically feasible without "compromising power conversion efficiencies, thus reducing material consumption". Solar inverters convert the DC power to AC power by performing MPPT process: solar inverter samples the output Power (I-V curve) from the solar cell and applies the proper resistance (load) to solar cells to obtain maximum power. MPP (Maximum power point) of the solar panel consists of MPP voltage (V mpp) and MPP current (I mpp): it is a capacity of the solar panel and the higher value can make higher MPP. Micro-inverted solar panels are wired in parallel, which produces more output than normal panels which are wired in series with the output of the series determined by the lowest performing panel (this is known as the "Christmas light effect"). Micro-inverters work independently so each panel contributes its maximum possible output given the available sunlight. Emerging, third generation solar technologies use advanced thin-film cells. They produce a relatively high-efficiency conversion for the low cost compared to other solar technologies. Also, high-cost, high-efficiency, and close-packed rectangular multi-junction (MJ) cells are preferably used in solar panels on spacecraft, as they offer the highest ratio of generated power per kilogram lifted into space. MJ-cells are compound semiconductors and made of gallium arsenide (GaAs) and other semiconductor materials. Another emerging PV technology using MJ-cells is concentrator photovoltaics ( CPV ). Flexible thin film cells and modules are created on the same production line by depositing the photoactive layer and other necessary layers on a flexible substrate. If the substrate is an insulator (e.g. polyester or polyimide film) then monolithic integration can be used. If it is a conductor then another technique for electrical connection must be used. The cells are assembled into modules by laminating them to a transparent colourless fluoropolymer on the front side (typically ETFE or FEP) and a polymer suitable for bonding to the final substrate on the other side. Several companies have begun embedding electronics into PV modules. This enables performing maximum power point tracking (MPPT) for each module individually, and the measurement of performance data for monitoring and fault detection at module level. Some of these solutions make use of power optimizers, a DC-to-DC converter technology developed to maximize the power harvest from solar photovoltaic systems. As of about 2010, such electronics can also compensate for shading effects, wherein a shadow falling across a section of a module causes the electrical output of one or more strings of cells in the module to fall to zero, but not having the output of the entire module fall to zero. Module performance is generally rated under standard test conditions (STC): irradiance of 1,000 W/m2, solar spectrum of AM 1.5 and module temperature at 25°C. Electrical characteristics include nominal power (PMAX, measured in W), open circuit voltage (VOC), short circuit current (ISC, measured in amperes), maximum power voltage (VMPP), maximum power current (IMPP), peak power, (watt-peak, Wp), and module efficiency (%). Nominal voltage refers to the voltage of the battery that the module is best suited to charge; this is a leftover term from the days when solar modules were only used to charge batteries. The actual voltage output of the module changes as lighting, temperature and load conditions change, so there is never one specific voltage at which the module operates. Nominal voltage allows users, at a glance, to make sure the module is compatible with a given system. Open circuit voltage or VOC is the maximum voltage that the module can produce when not connected to an electrical circuit or system. VOC can be measured with a voltmeter directly on an illuminated module's terminals or on its disconnected cable. The peak power rating, Wp, is the maximum output under standard test conditions (not the maximum possible output). Typical modules, which could measure approximately 1 m × 2 m or 3 ft 3 in × 6 ft 7 in, will be rated from as low as 75 W to as high as 350 W, depending on their efficiency. At the time of testing, the test modules are binned according to their test results, and a typical manufacturer might rate their modules in 5 W increments, and either rate them at +/- 3%, +/-5%, +3/-0% or +5/-0%. The ability of solar modules to withstand damage by rain, hail, heavy snow load, and cycles of heat and cold varies by manufacturer, although most solar panels on the U.S. market are UL listed, meaning they have gone through testing to withstand hail. Many crystalline silicon module manufacturers offer a limited warranty that guarantees electrical production for 10 years at 90% of rated power output and 25 years at 80%. Potential induced degradation (also called PID) is a potential induced performance degradation in crystalline photovoltaic modules, caused by so-called stray currents. This effect may cause power loss of up to 30%. The largest challenge for photovoltaic technology is said to be the purchase price per watt of electricity produced, new materials and manufacturing techniques continue to improve the price to power performance. The problem resides in the enormous activation energy that must be overcome for a photon to excite an electron for harvesting purposes. Advancements in photovoltaic technologies have brought about the process of "doping" the silicon substrate to lower the activation energy thereby making the panel more efficient in converting photons to retrievable electrons. Chemicals such as Boron (p-type) are applied into the semiconductor crystal in order to create donor and acceptor energy levels substantially closer to the valence and conductor bands. In doing so, the addition of Boron impurity allows the activation energy to decrease 20 fold from 1.12 eV to 0.05 eV. Since the potential difference (EB) is so low, the Boron is able to thermally ionize at room temperatures. This allows for free energy carriers in the conduction and valence bands thereby allowing greater conversion of photons to electrons. Solar panel conversion efficiency, typically in the 20% range, is reduced by dust, grime, pollen, and other particulates that accumulate on the solar panel. "A dirty solar panel can reduce its power capabilities by up to 30% in high dust/pollen or desert areas", says Seamus Curran, associate professor of physics at the University of Houston and director of the Institute for NanoEnergy, which specializes in the design, engineering, and assembly of nanostructures. Paying to have solar panels cleaned is often not a good investment; researchers found panels that had not been cleaned, or rained on, for 145 days during a summer drought in California, lost only 7.4% of their efficiency. Overall, for a typical residential solar system of 5 kW, washing panels halfway through the summer would translate into a mere $20 gain in electricity production until the summer drought ends—in about 2 ½ months. For larger commercial rooftop systems, the financial losses are bigger but still rarely enough to warrant the cost of washing the panels. On average, panels lost a little less than 0.05% of their overall efficiency per day. Most parts of a solar module can be recycled including up to 95% of certain semiconductor materials or the glass as well as large amounts of ferrous and non-ferrous metals. Some private companies and non-profit organizations are currently engaged in take-back and recycling operations for end-of-life modules. Silicon based modules: aluminum frames and junction boxes are dismantled manually at the beginning of the process. The module is then crushed in a mill and the different fractions are separated - glass, plastics and metals. It is possible to recover more than 80% of the incoming weight. This process can be performed by flat glass recyclers since morphology and composition of a PV module is similar to those flat glasses used in the building and automotive industry. The recovered glass for example is readily accepted by the glass foam and glass insulation industry. Non-silicon based modules: they require specific recycling technologies such as the use of chemical baths in order to separate the different semiconductor materials. For cadmium telluride modules, the recycling process begins by crushing the module and subsequently separating the different fractions. This recycling process is designed to recover up to 90% of the glass and 95% of the semiconductor materials contained. Some commercial-scale recycling facilities have been created in recent years by private companies. For aluminium flat plate reflector: the trendiness of the reflectors has been brought up by fabricating them using a thin layer (around 0.016 mm to 0.024 mm) of Aluminum coating present inside the non-recycled plastic food packages. Since 2010, there is an annual European conference bringing together manufacturers, recyclers and researchers to look at the future of PV module recycling. In 2010, 15.9 GW of solar PV system installations were completed, with solar PV pricing survey and market research company PVinsights reporting growth of 117.8% in solar PV installation on a year-on-year basis. With over 100% year-on-year growth in PV system installation, PV module makers dramatically increased their shipments of solar modules in 2010. They actively expanded their capacity and turned themselves into gigawatt GW players. According to PVinsights, five of the top ten PV module companies in 2010 are GW players. Suntech, First Solar, Sharp, Yingli and Trina Solar are GW producers now, and most of them doubled their shipments in 2010. The basis of producing solar panels revolves around the use of silicon cells. These silicon cells are typically 10-20% efficient at converting sunlight into electricity, with newer production models now exceeding 22%. In order for solar panels to become more efficient, researchers across the world have been trying to develop new technologies to make solar panels more effective at turning sunlight into energy. In 2014, the world's top four solar module producers in terms of shipped capacity during the calendar year of 2014 were Yingli, Trina Solar, Sharp Solar and Canadian Solar. Swanson's law states that with every doubling of production of panels, there has been a 20 percent reduction in the cost of panels. The price of solar electrical power has continued to fall so that in many countries it has become cheaper than ordinary fossil fuel electricity from the electricity grid since 2012, a phenomenon known as grid parity. Average pricing information divides in three pricing categories: those buying small quantities (modules of all sizes in the kilowatt range annually), mid-range buyers (typically up to 10 MWp annually), and large quantity buyers (self-explanatory—and with access to the lowest prices). Over the long term there is clearly a systematic reduction in the price of cells and modules. For example, in 2012 it was estimated that the quantity cost per watt was about US$0.60, which was 250 times lower than the cost in 1970 of US$150. A 2015 study shows price/kWh dropping by 10% per year since 1980, and predicts that solar could contribute 20% of total electricity consumption by 2030, whereas the International Energy Agency predicts 16% by 2050. Real world energy production costs depend a great deal on local weather conditions. In a cloudy country such as the United Kingdom, the cost per produced kWh is higher than in sunnier countries like Spain. According to .S. Energy Information Administration, prices per megawatthour are expected to converge and reach parity with conventional energy production sources during the period 2020-2030. According to EIA, the parity can be achieved without need for subsidy support and can be accomplished through organic market mechanisms, namely production price reduction and an technological advancement. Following to RMI, Balance-of-System (BoS) elements, this is, non-module cost of non-microinverter solar modules (as wiring, converters, racking systems and various components) make up about half of the total costs of installations. For merchant solar power stations, where the electricity is being sold into the electricity transmission network, the cost of solar energy will need to match the wholesale electricity price. This point is sometimes called 'wholesale grid parity' or 'busbar parity'. Some photovoltaic systems, such as rooftop installations, can supply power directly to an electricity user. In these cases, the installation can be competitive when the output cost matches the price at which the user pays for his electricity consumption. This situation is sometimes called 'retail grid parity', 'socket parity' or 'dynamic grid parity'. Research carried out by UN-Energy in 2012 suggests areas of sunny countries with high electricity prices, such as Italy, Spain and Australia, and areas using diesel generators, have reached retail grid parity. Pole mounts, which are driven directly into the ground or embedded in concrete. Ballasted footing mounts, such as concrete or steel bases that use weight to secure the solar module system in position and do not require ground penetration. This type of mounting system is well suited for sites where excavation is not possible such as capped landfills and simplifies decommissioning or relocation of solar module systems. Rail mounts, which are attached directly to the roof structure and may use additional rails for attaching the module racking or frames. Ballasted footing mounts, such as concrete or steel bases that use weight to secure the panel system in position and do not require through penetration. This mounting method allows for decommissioning or relocation of solar panel systems with no adverse effect on the roof structure. Solar trackers increase the amount of energy produced per module at a cost of mechanical complexity and need for maintenance. They sense the direction of the Sun and tilt or rotate the modules as needed for maximum exposure to the light. Alternatively, fixed racks hold modules stationary as the sun moves across the sky. The fixed rack sets the angle at which the module is held. Tilt angles equivalent to an installation's latitude are common. Most of these fixed racks are set on poles above ground. Panels that face West or East may provide slightly lower energy, but evens out the supply, and may provide more power during peak demand. Electrical Safety Tester (EST) Series (EST-460, EST-22V, EST-22H, EST-110). Outdoor solar panels usually includes MC4 connectors. Automotive solar panels also can include car lighter and USB adapter. Indoor panels (including solar pv glasses, thin films and windows) can integrate microinverter (AC Solar panels). Solar panel has been a well-known method of generating clean, emission free electricity. However, it produces only direct current electricity (DC), which is not what normal appliances use. Solar photovoltaic systems (solar PV systems) are often made of solar PV panels (modules) and inverter (changing DC to AC). Solar PV panels are mainly made of solar photovoltaic cells, which has no fundamental difference to the material for making computer chips. The process of producing solar PV cells (computer chips) is energy intensive and involves highly poisonous and environmental toxic chemicals. There are few solar PV manufacturing plants around the world producing PV modules with energy produced from PV. This measure greatly reduces the carbon footprint during the manufacturing process. Managing the chemicals used in the manufacturing process is subject to the factories' local laws and regulations. With the increasing levels of rooftop photovoltaic systems, the energy flow becomes 2-way. When there is more local generation than consumption, electricity is exported to the grid. However, electricity network traditionally is not designed to deal with the 2- way energy transfer. Therefore, some technical issues may occur. For example in Queensland Australia, there have been more than 30% of households with rooftop PV by the end of 2017. The famous Californian 2020 duck curve appears very often for a lot of communities from 2015 onwards. An over-voltage issue may come out as the electricity flows from these PV households back to the network. There are solutions to manage the over voltage issue, such as regulating PV inverter power factor, new voltage and energy control equipment at electricity distributor level, re-conducting the electricity wires, demand side management, etc. There are often limitations and costs related to these solutions. There is no silver bullet in electricity or energy demand and bill management, because customers (sites) have different specific situations, e.g. different comfort/convenience needs, different electricity tariffs, or different usage patterns. Electricity tariff may have a few elements, such as daily access and metering charge, energy charge (based on kWh, MWh) or peak demand charge (e.g. a price for the highest 30min energy consumption in a month). PV is a promising option for reducing energy charge when electricity price is reasonably high and continuously increasing, such as in Australia and Germany. However for sites with peak demand charge in place, PV may be less attractive if peak demands mostly occur in the late afternoon to early evening, for example residential communities. Overall, energy investment is largely an economical decision and it is better to make investment decisions based on systematical evaluation of options in operational improvement, energy efficiency, onsite generation and energy storage. PV connectors MC4: Weatherproof DC connectors. ^ Li, Wei; Rubin, Tzameret H; Onyina, Paul A (2013). "Comparing Solar Water Heater Popularization Policies in China, Israel and Australia: The Roles of Governments in Adopting Green Innovations". Sustainable Development. 21 (3): 160–70. doi:10.1002/sd.1547. ^ "Metal Stamped Parts for Solar Paneling | American Industrial". American Industrial. Retrieved 14 March 2018. ^ a b c "April 25, 1954: Bell Labs Demonstrates the First Practical Silicon Solar Cell". APS News. American Physical Society. 18 (4). April 2009. ^ Christian, M. "The history of the invention of the solar panel summary". Engergymatters.com. Energymatters.com. Retrieved 25 January 2019. ^ Adams, William Grylls; Day, R. E. (1 January 1877). "IX. The action of light on selenium". Philosophical Transactions of the Royal Society of London. 167: 313–316. doi:10.1098/rstl.1877.0009. ISSN 0261-0523. Retrieved 7 September 2018. ^ Meyers, Glenn (31 December 2014). "Photovoltaic Dreaming 1875--1905: First Attempts At Commercializing PV". cleantechnica.com. Sustainable Enterprises Media Inc. CleanTechnica. Retrieved 7 September 2018. ^ Ohl, Russell (27 May 1941). "Light-sensitive electric device". Google. Retrieved 7 September 2018. ^ Ulanoff, Lance (2 October 2015). "Elon Musk and SolarCity unveil 'world's most efficient' solar panel". Mashable. Retrieved 9 September 2018. ^ da Silva, Wilson (17 May 2016). "Milestone in solar cell efficiency achieved". ScienceDaily. Retrieved 9 September 2018. A new solar cell configuration developed by engineers at the University of New South Wales has pushed sunlight-to-electricity conversion efficiency to 34.5% -- establishing a new world record for unfocused sunlight and nudging closer to the theoretical limits for such a device. ^ Orcutt, Mike. "Managing Light To Increase Solar Efficiency". MIT Technology Review. Retrieved 14 March 2018. ^ KING, R.R., et al., Appl. Phys. Letters 90 (2007) 183516. ^ "HIT® Photovoltaic Module" (PDF). Sanyo / Panasonic. Retrieved 25 November 2016. ^ "Improving the efficiency of solar panels". The Hindu. 24 October 2013. Retrieved 24 October 2013. ^ "Micro Inverters for Residential Solar Arrays". Retrieved 10 May 2017. ^ "nominal voltage Definition and Meaning". www.dictionaryofengineering.com. Retrieved 4 September 2017. ^ "First Solar – FS-377 / FS-380 / FS-382 / FS-385 Datasheet" (PDF). Retrieved 4 June 2012. ^ "TSM PC/PM14 Datasheet" (PDF). Archived from the original (PDF) on 29 October 2013. Retrieved 4 June 2012. ^ "LBS Poly 260 275 Data sheet" (PDF). Retrieved 9 January 2018. ^ "Are Solar Panels Affected by Weather? - Energy Informative". Energy Informative. Retrieved 14 March 2018. ^ "CTI Solar sales brochure" (PDF). cti-solar.com. Retrieved 3 September 2010. ^ "Solarplaza Potential Induced Degradation: Combatting a Phantom Menace". www.solarplaza.com. Retrieved 4 September 2017. ^ (www.inspire.cz), INSPIRE CZ s.r.o. "What is PID? — eicero". eicero.com. Retrieved 4 September 2017. ^ "How Solar Cells Work". HowStuffWorks. Retrieved 9 December 2015. ^ "Bonding in Metals and Semiconductors". 2012books.lardbucket.org. Retrieved 9 December 2015. ^ Crawford, Mike (October 2012). "Self-Cleaning Solar Panels Maximize Efficiency". The American Society of Mechanical Engineers. ASME. Retrieved 15 September 2014. ^ Patringenaru, Ioana (August 2013). "Cleaning Solar Panels Often Not Worth the Cost, Engineers at UC San Diego Find". UC San Diego News Center. UC San Diego News Center. Retrieved 31 May 2015. ^ Lisa Krueger "Overview of First Solar's Module Collection and Recycling Program" (PDF). Brookhaven National Laboratory p. 23. Retrieved 17 March 2017. ^ Wambach, K. "A Voluntary Take Back Scheme and Industrial Recycling of Photovoltaic Modules" (PDF). Brookhaven National Laboratory p. 37. Retrieved 17 March 2017. ^ Cynthia, Latunussa (9 October 2015). "Solar Panels can be recycled - BetterWorldSolutions - The Netherlands". BetterWorldSolutions - The Netherlands. Retrieved 29 April 2018. ^ Latunussa, Cynthia E.L.; Ardente, Fulvio; Blengini, Gian Andrea; Mancini, Lucia (2016). "Life Cycle Assessment of an innovative recycling process for crystalline silicon photovoltaic panels". Solar Energy Materials and Solar Cells. 156: 101–11. doi:10.1016/j.solmat.2016.03.020. ^ Sonu, Mishra (21 December 2017). "Enhanced radiation trapping technique using low-cost aluminium flat plate reflector a performance analysis on solar PV modules". 2nd International Conference for Convergence in Technology (I2CT). ^ "First Breakthrough In Solar Photovoltaic Module Recycling, Experts Say". European Photovoltaic Industry Association. Archived from the original on 12 May 2013. Retrieved 1 January 2011. ^ "3rd International Conference on PV Module Recycling". PV CYCLE. Archived from the original on 10 December 2012. Retrieved 1 October 2012. ^ "Solar Power Plant Report". ^ "PVinsights announces worldwide 2010 top 10 ranking of PV module makers". www.pvinsights.com. Retrieved 6 May 2011. ^ "What are solar panels made of?". www.solarpowerworldonline.com. ^ "Grand Challenges Make Solar Energy Economical". www.engineeringchallenges.org. ^ "SolarCity Press Release". 2 October 2015. Retrieved 20 April 2017. ^ Giges, Nancy (April 2014). "Making Solar Panels More Efficient". ASME.org. Retrieved 9 September 2018. ^ "Leaders and laggards of the top 10 PV module manufacturers in 2014". PV Tech. Retrieved 21 February 2015. ^ "Swanson's Law and Making US Solar Scale Like Germany". Greentech Media. 24 November 2014. ^ a b c Morgan Baziliana; et al. (17 May 2012). Re-considering the economics of photovoltaic power. UN-Energy (Report). United Nations. Archived from the original on 16 May 2016. Retrieved 20 November 2012. ^ ENF Ltd. (8 January 2013). "Small Chinese Solar Manufacturers Decimated in 2012 | Solar PV Business News | ENF Company Directory". Enfsolar.com. Retrieved 29 August 2013. ^ Harnessing Light. National Research Council. 1997. p. 162. ^ Farmer, J. Doyne; Lafond, François (2016). "How predictable is technological progress?". Research Policy. 45 (3): 647–65. arXiv:1502.05274. doi:10.1016/j.respol.2015.11.001. ^ MacDonald, A. E., Clack, C. T., Alexander, A., Dunbar, A., Wilczak, J., & Xie, Y. (2016). Future cost-competitive electricity systems and their impact on US CO 2 emissions. Nature Climate Change, 6(5), 526. ^ "Solar Photovoltaics competing in the energy sector – On the road to competitiveness" (PDF). EPIA. Archived from the original (PDF) on 26 February 2013. Retrieved 1 August 2012. ^ "A Guide To Photovoltaic System Design And Installation". ecodiy.org. Retrieved 26 July 2011. ^ Shingleton, J. "One-Axis Trackers – Improved Reliability, Durability, Performance, and Cost Reduction" (PDF). National Renewable Energy Laboratory. Retrieved 30 December 2012. ^ Mousazadeh, Hossain; et al. "A review of principle and sun-tracking methods for maximizing" (PDF). Renewable and Sustainable Energy Reviews 13 (2009) 1800–1818. Elsevier. Retrieved 30 December 2012. ^ "Optimum Tilt of Solar Panels". MACS Lab. Retrieved 19 October 2014. ^ Perry, Keith (28 July 2014). "Most solar panels are facing the wrong direction, say scientists". The Daily Telegraph. Retrieved 9 September 2018. ^ Miller, Wendy; Liu, Aaron; Amin, Zakaria; Wagner, Andreas (2018). "Power Quality and Rooftop-Photovoltaic Households: An Examination of Measured Data at Point of Customer Connection". Sustainability. 10 (4): 1224. doi:10.3390/su10041224. ^ Miller, Wendy; Liu, Lei Aaron; Amin, Zakaria; Gray, Matthew (2018). "Involving occupants in net-zero-energy solar housing retrofits: An Australian sub-tropical case study". Solar Energy. 159: 390–404. doi:10.1016/j.solener.2017.10.008. Wikimedia Commons has media related to Photovoltaics. This page was last edited on 25 April 2019, at 06:35 (UTC).